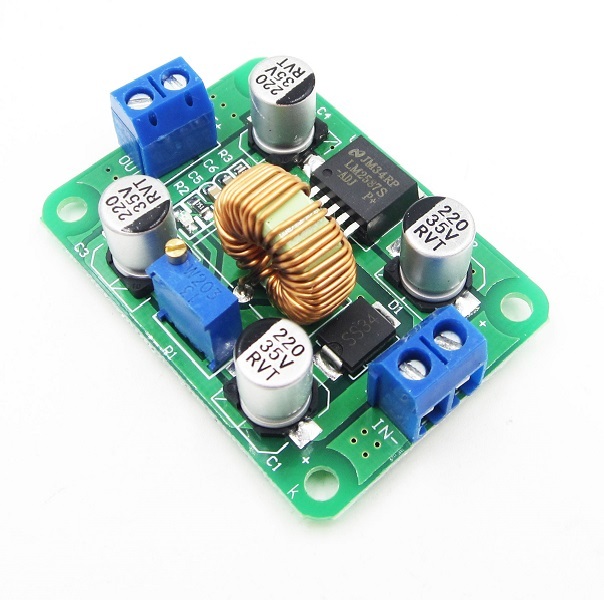 This LM2587 DC – DC Boost Converter Module Breakout Board is useful for stepping up a DC power supply to a higher DC power supply. This LM2587 DC – DC Boost Converter Module Breakout Board is useful for stepping up a DC power supply to a higher DC power supply. It uses the LM2587 boost converter IC from Texas Instruments. It is useful for applications requiring stable, constant power from a DC power supply. Connect your power input to the terminal blocks labelled IN+ (positive input power supply) and IN- (GND input). Connect a multimeter to the terminals marked OUT+ and OUT- and adjust the small blue potentiometer on the board until desired voltage is reached. Connect your output to the terminals marked OUT + and OUT-.